am from the vale of Kashmir. My journey from Chinar to Gum started seeking peace and harmony and resulted in my destiny in the so called lucky country called Australia about 18 years ago. I was moved to begin this journey because of the terrorism and blood shed which was occurring on large scale in the valley. I decided to migrate to Australia and landed in Canberra. Truly speaking, I found Canberra just like my old Kashmir similar in many ways; quiet, calm, peaceful, tranquil, beautiful and full of pleasant people. The thing which I have missed most over the years is the world famous Dal Lake. Dal has haunted and taunted me over the years. 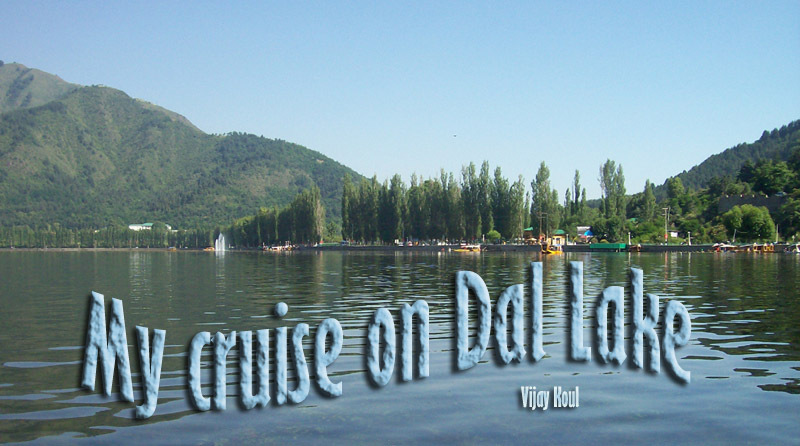 The “cruise to Dal Lake” is written to alleviate my frustration, and to familiarise the reader with the world’s most beautiful place called Dal. When I was young, a cruise to Dal Lake was always a dream for me, but as I belonged to a middle class family it was always out of bounds. Luckily my Auntie (Massi, my mother’s sister who was a wife of a wealthy businessman and also being my much loved auntie) I shared my dream with her. Massi must have spoken to her husband Mr Zuthshi, who agreed to organise a cruise for his and our family, when he got some spare time from his busy schedule. My good fortune was realised when Mr Zuthshi arranged a House Boat called Doonga in Kashmir during my school holidays which occur in July. One day my Uncle and Auntie came to us with a surprise that their family of 5 members and our family are going cruising next Friday. I was delighted and started counting the days for the cruise to take place. For me the wait was like a century but the day arrived and our family was supposed to meet them at Amira Kadal. (A bridge over the famous river Jehlum). All of us reached there on time, but to my surprise the Doonga was not there. I started cursing my luck but after one hour of waiting I could see the relief on the face of my Uncle who saw that the Doonga was waiting on the other side of the river. We all ran to the other side of the river to board the Doonga. I was the first one to jump in the Doonga. The Doonga is like a large decked punt about 22 mtr long and 3.5 mtr wide in the middle, tapering towards the ends. Its Structure is a light wooden frame with covered roof and sides with thick matting. It looks like elongated Noah’s ark made of reeds. The body is divided into compartments. Each partition is divided with a partition of wood and curtains. The matting on top acts as insulation which keeps the Doonga cool in summer and warm in winter. Our Doonga had 4 compartments. All 3 compartments were carpeted with rugs and pillows on the side. The side of 4th compartment on one side was a kitchen with mud oven and a kerosene stove and the other side was dining space. We were lucky this Doonga had a roof over the porch flat and a low rail around it where one can sit with access through the kitchen by wooden stairs. The owners of the Doonga were Riyaz and his wife Zooni. Riyaz was a handsome, tall, well built, educated guy. He has many Doongas which cater for tourists. Riyaz looked very friendly but Zooni was a bit reticent and shy. My keenness about the Doonga made him friendlier to me than my cousins. To my surprise he had a year 10 pass working in the Govt Dept. All the rations including, meat, milk, crockery and blankets etc were stacked in the rooms. Everyone looked very happy and excited I could see the happiness on the faces of my parents, uncle and auntie. All my cousins were happy too. But I was the most happy and excited of all; because this was the first time in my life I was having a cruise. It was about 7 pm, cloudy mixed with clear sky and dusk approaching fast. The Jehlum was flowing calmly across the level plain. Riyaz started yelling that we should leave early otherwise dal gate would be closed. We had to be there by 8 o clock. Dal gate is a locked gate between an off shoot of the Jehlum River and Dal Lake. The gate is always closed so that there is not an over flow of water from jehlum to Dal especially during flood season. The Doonga was propelled by a long stick about 5 mtr long and 4 cm diameter. Zooni was using the Paddler. The Doonga was going against the flow of water so Riyaz and Zooni were finding it hard. My uncle, a well built fellow, started to help them with energetic passion. After a 2 km cruise in the Jehlum I was so happy that it was very hard to express. My Dad asked for tea but was told that tea would be served once we crossed the Dal gate. Riyaz sounded very optimistic that we would manage to cross the gate in time, but both Riyaz and Zooni and my uncle were sweating hard. Nobody wanted to spend the night in Jehlum. To our surprise they just made it by 7.55 pm. Once the doonga crossed into the lake everyone sighed with relief as our doonga was now in Dal Lake. As it was getting dark, the lights were on in the doonga and all we could see outside was the shimmering reflection of lights on the crystal clear water of the lake, the houseboats, numerous shikaras (boats) roaming across the lake and on the shoreline visitors walking and enjoying on the famous Boulevard Road. Now Riyaz and Zooni started rowing slowly. My auntie was kind enough to make a cup of tea for all of us, particularly for Riyaz and Zooni who made it through the gate just on time, and my dad who had been whingeing a long time for the cup of tea. At about 10 pm we reached Nehru Park a small island in Dal Lake. Riyaz anchored the Doonga and all of us prepared for our overnight stay. Mum and Auntie cooked the rice the fish curry was already homemade. Every one was tired so it was time for sleeping. I wanted to sleep on the porch but to my surprise there was no room left because that was grabbed by my cousins who had already they put their mats there, Me being the youngest among the lot of us was told tomorrow would be my turn. Exhausted I had my dinner and went to sleep. After 1 hour of sleep, I was awoken up by my cousin who told me that I can go up and sleep on the porch. I was delighted and thanked him for his generosity. I went up and my cousins gave me a little room to squeeze myself. I realised my cousin could not bear the mozzie bites, and that was the reason for his generosity. The mozzies were very friendly but they did not bother me much, and I thanked them for biting my cousin and making him swap with me. For about 2 hours I could not sleep because the sky was just brilliant and a marvellous experience to sleep under the stars. The cold breeze was barely blowing and the night was so clear. It is hard to explain the joy I experienced, sleeping under the stars. For the first time in my life I realised how beautiful and serene the moon and stars look at night. Next morning at about 5.30 I got up to a magnificent view of Shankaracharya hill on one side. On the other side of the lake I could see Hari Parbat. The mountain outlines were reflecting in the water of Dal, enhancing its beauty. I saw the sun rise across the mountains. The sunrise itself was just magnificent to watch. There were hundreds of shikaras plying across Dal of many different shapes and sizes the scene was magnificent and included many fowls and ducks. I went down stairs and found that all were awake and were discussing what to have for breakfast. First of all though, everyone wanted to have a swim in the Dal. Riyaz moved the doonga from Nehru Park to Gagribal which is another part of Dal The water of Gagribal is praised for its purity and lightness. It is a good place for swimmers and for surfing too. Riyaz told me that this part of Dal is kept weed free. Unfortunately amongst the male folk I was the only one who did not know how to swim. I was told that was not allowed to go in the water, while other people could have fun. My father could not resist my long face and was kind enough to manage to get a tube from somewhere. I was allowed to float in the lake too, while my father, uncle and other cousins were always on guard. It was great fun. As the morning continued, I could see water boats. There were westerner’s water skiing. It was again fascinating to watch them. Being in the water provided immense enjoyment too. I was sitting on the porch and was totally intrigued, watching other people water skiing, when at 10’Clock we were called to have breakfast, served on the top of the doonga. The fresh green tints of trees and mountains were just gleaming in the water. To the west of Dal I could easily see mountains covered with snow. Out of curiosity I asked Riyaz and Zooni which is the best season to cruise on lake Dal I was told it is the autumn when willows change from green to silver and delicate russet with burgundy tone on stems and branches. The chinars are crimson and poplars stand like golden poles. It was now time to go further towards the interior of the lake. As we were proceeding I saw ducks swimming in such a formation that mother duck followed by the little ducklings created waves in the water which looked like spherical pyramids in the water. Further on, aquatic weeds which gave a look of a stagnant river or canal covered with thousands of lotus blossoms splendid. Riyaz showed me the sight of a floating garden which is called Radh in Kashmir. The gardens are formed by roots and stems of aquatic plants growing in shallow water, but unattached so that they lose all connection with the lake bottom. When detached they are pressed into beds of about 2 mtr in breadth and 20 mtr length The heads of sedge seeds and other plants are cut and laid on the surface and covered with mud which sinks on matted roots The beds float but are kept in place by a stake of willow driven through each end. These gardens can yield tomatoes cucumbers melons and many other vegetables. Riyaz told me since the fields are so alike in appearance that theft very often occurs and is difficult to trace. The tenants often steal at dead night by tugging them away by the boats. Near one of these floating gardens we had lunch and Salty Tea (Sheer Chai in Kashmiri). The leaves along with pinch of soda bicarb are brewed for a longer period than the normal tea and at the end milk and pinch of salt is added instead of sugar. For me initially it was hard to drink, but it did not take much time to acquire the taste of this tea. From there we entered to Bod Dal, a part of the lake which means big dal and looked like sheet of aquamarine embossed with emerald green. A clump of 4 chinars on a small island (Rupa Lank in Kashmiri) made up an artificial island where boat could be anchored during a storm. The island is highly decorated with flowers such as roses, pansies, dahlia, zinnia and salvia. We had a night sleep here and following another glorious morning we passed camel bridge, known as Oont kadal in Kashmiri, which looks like the hump of a camel. The water was dark blue with no weeds. Here I saw couple of fishermen standing on the edge of a small boat throwing their nets in to catch fish. This part of Dal was very tranquil, and often in the morning, the fog creeps onto Dal like a semi transparent veil. Towards the mountains I could see the clouds were throwing their long arms upward to cuddle the mountain tops. I watched this spectacular natural scene which put me into a deep trance, and I felt like I would faint As far as the eye could see was water and shore decorated with willows and poplars. Eagles flying high and their reflections mirrored in the deep blue water. From the lake the doonga passed through a narrow channel bordered by weeping willows and poplars. Here we saw young boys fishing with home made fishing rods made of willow sticks with string attached to the fishing hook. Though amateurs, they were indeed catching fish using earthworms as bait. As we proceeded further towards the shore it was like dream which is fading away till we reached Nishat Bagh (Garden of bliss). Laid in 1632 by Mogul Empire Jahangir. These are a beautiful terraced garden with chinars on the sides. The view of the Dal is superb from here we had a lunch and that was the end of cruise. While thanking Riyaz and Zooni I told them I felt more like I had been into a seventh heaven on this cruise. To this remark they replied in one voice “Agar Firdous bar rue zaminast Haminasto Haminasto Haminasto” I could not understand what they were saying and requested the meaning of this saying, which in the Persian language said by Jahangir “If there is paradise on earth that is this, that is this, that is this”. Even now when I close my eyes and think of that cruise and meditate on my time on lake Dal, I still believe it is the most consecrated spot in terms of its natural but astonishing beauty on earth. What Jahangir has said in 17th century holds true even today, that no part of the world is as beautiful as Kashmir. Dal is a heaven within heaven. *Vijay Koul originally hails from Srinagar. 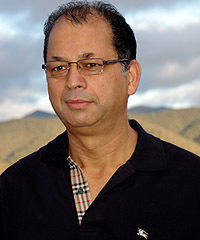 After obtaining his Master's in Forestry he worked as Scientist in SKUAST (J&K) and TERI Tata Energy Research Institute (New Delhi) before moving to Canberra in 1992. Presently working Research Project Officer in Forest Hydrology with CSIRO Commonwealth Scientific and Industrial Research Organisation. CSIRO is Australia's national science agency. Currently involved with Ecohydrology of Eucalypt plantation on low rainfall floodplain. He has contributed about 25 research based publications and articles in National and International Journals. He has a great passions for travelling, Kashmiri Bhajans and Kashmiri music. Please visit his website to enjoy some immortal Kashmiri Bhajans http://www.youtube.com/user/panzy2?feature=mhDr. Most interested and well expressed his childhood experience. Just made me remember my childhood days we had a similar cruise. What you guys have missed is Wazwan. Wish can do it again with my family back in Kashmir. It's really beautifully written. I was easily flown into the cherished memories of our trip to Kashmir. Really beautiful place - heaven on the earth! Thanks for sharing your memories - keep them alive. This writing, filled with all the enthusiasm of youth, creates a magnetic pull towards the lake that is irresistable. I have dreamed of floating on this lake too.... maybe it is finally time to realise that dream! Dear Vijay ji, What a beautiful, descriptive article!! I actually imagined myself reliving the moments I spent in and around Dal Lake when we lived in Kashmir a long time ago. Please keep writing such articles which keep us in touch with what Kashmir was when we were there. Really nice experience, reading this just made me nostalgic about my time spent in Kashmir. Thanks very much for sharing, please keep writing. Aaacha aap likhtein bhi hain?